We are closed for the 2019 season! Thank you for a wonderful sugaring season, and we'll see you for pancakes next year! Don't forget you can buy maple products anytime. Just click on 'store' above, place your order, and fresh syrup will arrive at your door. For local pickup, call 413-773-5186 or email williamsfarmsugarhouse@gmail.com. 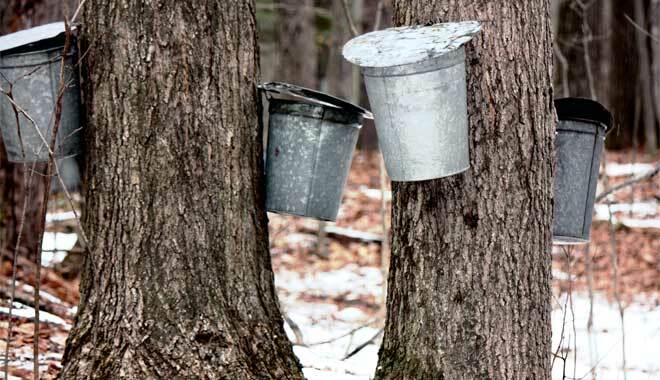 Our family has been tapping sugar maple trees and making syrup for five generations. Milton Hubbard Williams began the tradition in the mid-1800s, followed by his son Kenneth Sanderson Williams. The original Williams sugarhouse was one of thirteen located on Mount Toby in Sunderland, MA. In the mid-1960s, amidst growing success and realizing the need for a better retail location, Kenneth Jr. and his brother Milton moved the sugarhouse off the mountain to scenic Route 47 in North Sunderland. Our family's final move came in 1994 when we were able to build a sugarhouse near our farm in Deerfield, MA. One hundred and fifty-eight years later, the sugaring operation continues by the fourth (Kenneth "Sandy" Williams, III) and fifth (Kenneth "Chip" Williams, IV) generations and Pam, Kelly, Casey, and Chip's wife Alissa and their two sons. Today you can visit our post and beam sugarhouse at 491 Greenfield Road, nestled at the foot of the Pocumtuck Range in Deerfield.